He wanted to make sure, but I didn’t need gravy fries to entice me to come. Not that day. Not after I had hopped on a plane and traveled halfway up the east coast for that weekend. Not after I had made flight reservations more than a month earlier in preparation for that historic day in Cat Town. Nope, I didn’t need a wake up call. I didn’t even need the two alarm clocks I had set the night before just in case. At 7 a.m. my eyes were open and that was it. No more sleeping, just adrenaline and anxious thoughts churning through my mind as I lay in bed, trying to save as much energy for the game. No, I wasn’t playing, but I felt like the sixth man, the fan in the stands cheering for the Catamounts to pounce on the Black Bears for the America East title. Finally, I put on my new, dark-green Vermont basketball shirt, which Reza had given to me the night before, and as I headed up Pearl Street, I wore my coat and hood to fend off the typical cold and cloudy March weather in Burlington. Not too many cars were on the road. It was a Saturday morning. I looked up in the direction of Patrick Gym and saw the sun trying to peek through the gray sky. To my back, a mostly blue sky hovered over Lake Champlain. As I walked with steps of anxiety and excitement, I began to worry that I forgot something. I doubled checked – my camera, my wallet, my phone. I called my mom in Connecticut and reminded her to tape the game. 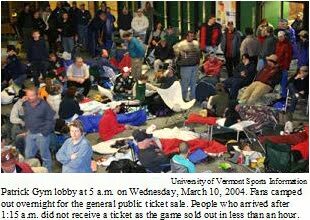 Approaching Patrick Gym, I saw a bunch of bundled UVM fans in front of a red Nectar’s banner, waiting in line for free hot chocolate, bagels and gravy fries. Although I had an empty stomach, I didn’t wait in line, at least not outside. I wanted my ticket and to find the Lands first. I opened the door into the Patrick Gym lobby and there were Buzz and Donna, one of a few hundred fans who arrived early. Buzz said they were waiting for me and that he had called me 10 minutes earlier. 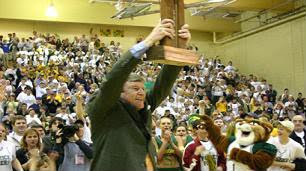 There had been so much hysteria building up to the 11:30 a.m. tipoff that I would have had to have been dead to miss it. It was the first national television broadcast from Patrick Gym since Sugar Ray Leonard fought in the 1976 U.S. Olympic Boxing Trials. “We’re going to make a decision at game time,” Reza said. “He’s still beating everybody with one hand,” Reza said with a laugh. That same night at the Land’s dinner table, we were passing around and soaking up various Catamount basketball anecdotes like Donna’s rolls and mashed potatoes and gravy. “You know, a lot of people, the coaches included, weren’t sure if Taylor would be able to play Division 1,” Buzz said. “Yeah, he was a scrawny freshman,” I said. “Yeah, he was only 6-foot-7 then, but he grew two inches,” Reza said. “I can’t believe some big-time school didn’t sign him,” I said. And since his first year at UVM, Taylor Coppenrath added more than 50 pounds on his muscular, yet unassuming frame and averaged more than 24 points per game as he was named Kevin Roberson America East Player of the Year for the second straight season. But his consistently brilliant play was not the only reason he was the favorite topic of conversation days before the March 13 championship game. No one knew for sure whether he was going to play or not, except Taylor himself. On Feb. 11, he broke the scaphoid bone in his left wrist while drawing a charge against Stony Brook. Coppenrath hadn’t suited up since Feb. 15 against Boston University, and was absent from recent tournament wins over New Hampshire and Hartford. Coppenrath’s father, George, was one of the few people who did not want him to play, fearing further injury and the risk of Taylor’s wrist never healing properly. Besides the Maine fans, George might have been the only person who didn’t want Taylor on the court since Taylor’s cast was removed Monday and he began light practices. For Taylor, this was the perfect situation, wasn’t it? He hadn’t played in a month, so people would understand if he had a sub-par performance. If he was just out there scoring a few baskets, grabbing some rebounds and playing defense, wouldn’t that be all any Vermont fan could ask for? It is Vermont, after all, not Connecticut or Kentucky. Still, everyone knows he carries the weight of UVM’s offensive production, especially if T.J. Sorrentine is cold. Pressure or no pressure, a sellout crowd of 3,228 couldn’t have ever dreamed of what they were about to witness. In the Patrick Gym lobby signs with each UVM player’s name and jersey number hung from the second-floor railing. So did a banner over the souvenir shop – WELCOME TO CATAMOUNT COUNTRY. I still wanted my ticket, so I waited in the player will-call line. Reza had saved me and his girlfriend Erin tickets. Only Alex Jensen’s mother and Jack Phelan’s parents were ahead of me in line. The lobby wasn’t even half-full, yet. Then more fans arrived. Among them, I said hi to my former classmates Andre Anderson and Grant Anderson and Trevor Gaines. How time flies, I thought, they graduated. So did Craig Peper and Jared Steele, who mingled with the UVM basketball family before tipoff. Nostalgic thoughts fidgeted in my mind. Wasn’t I just playing ball with those guys? Weren’t we just drinking together? I felt old. After an hour of clinging to my spot in line, I got my ticket and it was into Patrick Gym! Besides the lack of empty seats, the first thing I noticed was the lighting; it seemed a bit dimmer than I remembered. The court and seating on both sides of the gym were still the same – small, cozy and close to the action. Some call it a glorified high school gym, but it represents the state well. Every seat is a good seat. 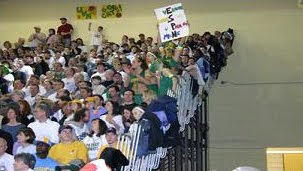 However, sitting halfway up at mid-court was better than many other spots, such as the location of the UVM students -- who postponed their spring break plans -- and were seated farthest back on both sides of the gym. I spotted Buzz and Donna almost directly across from me. Buzz had a convenient aisle seat for the end-of-the-game celebration. The UVM players came out of the locker as a loud cheer from the Cat fans muffled Jay-Z blaring from the speakers. UVM had its cheerleaders near the Vermont bench. Facing them at the opposite end, were the Maine cheerleaders, who in their light blue outfits looked out of place. It was hard to spot a Black Bear fan. The stands seemed full, but more and more people filed in, many of whom wore their white “Patrick Power!” T-shirts. Man, I was glad I didn’t go to Cancun or Florida for spring break. 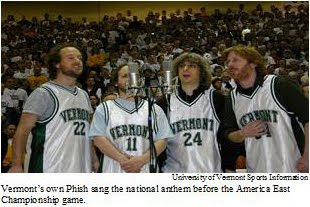 Vermont’s own, Phish sang the national anthem as viewers from across America could have seen on ESPN that Saturday morning. Then the starting lineups were announced. Coppenrath and his floppy, moppy hairdo and elastic wrap around his left wrist was starting. The fans were elated. George Coppenrath was trembling inside. As Scotty Jones jumped for the tipoff, I flashed my camera and Sorrentine grabbed the ball. Gametime! Maine scored the first basket. At the other end, Coppenrath put Vermont on the scoreboard with a layup and foul at 18:35. He converted the old-fashioned three-point play. It was only the beginning for Coppenrath. Baseline jumper. Layup. Layup. Three-pointer at the top of the key, giving UVM a 20-10 lead in which Coppenrath had 12 points and hadn’t missed yet. Each time he scored, I looked across the gym and pumped my fists in the air as I saw Buzz doing likewise. I felt like Buzz was sitting next to me each time I saw him and I knew he was glad he used his seniority and made the rare call out of work. I told the middle-aged guy wearing a green clown wig in front of me that Taylor might score 40 points. I actually had started saying that after Taylor’s seventh point, for the record. “He may,” he answered me. “That’s all day,” said another. “Bring on Duke,” said yet another. Brennan told his team, as any coach would have, to keep feeding Coppenrath the ball. Maine coach John Giannini decided to double team No. 22 in the second half, and that plus the fact UVM was cold helped the Black Bears claw their way back, trailing 49-41 midway through the half. Maybe the delay in the game at 14:05 played in Maine’s favor as the shot clocks stopped working. I kept booing the refs the entire time. It seemed like the right thing to do since I didn’t know what was going on at the time and I was fearing the notorious Cat Collapse. Several minutes later officials placed auxiliary clocks on the floor on each side of the court. 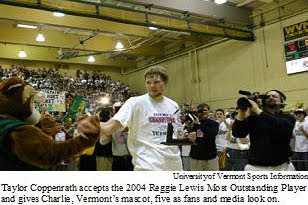 However, Coppenrath kept scoring, mostly from the foul line as Vermont students chanted, “You Can’t Stop Him! You Can’t Stop Him!” And everyone in the building new it was true. With Maine hanging around, Sorrentine picked a critical time, with 5:52 remaining, to drain his only three-pointer of the game, giving Vermont a 15-point cushion and two Brennan arms in the air. Giannini said that at Sorrentine’s three-point shot and several other times during the game he couldn’t call instructions to his players because the crowd was so loud. Coppenrath tipped in a shot for his 42nd and 43rd point with 50 seconds left in the game. A few possessions later, I watched senior Corey Sullivan soar for an easy two-handed alley-oop dunk as I stood in the aisle ready to storm the court. The final seconds ticked off the scoreboard, which read, VERMONT 72 VISITOR 53. I sure was. I ran in between the UVM bench chairs and headed for center court where most of the student section had mobbed the players. I gave David Hehn a hug, not because I knew him, but because it’s just the thing to do at that moment. I jumped up and down like I had won the lottery, and in many respects it felt better than anything monetary or material. I saw Reza and I had someone take our picture. I said hi to Scotty and Grant and Trevor in the mist of the mayhem. Then, I felt a tap on my shoulder. I turned around. It was Buzz! I held my camera in front of us and took a picture. It was a surreal moment. A few minutes later fans walked onto the court or cheered from their seats, as Donna had, as the players and Brennan cut down the net. Buzz and I stood next to the ladder as I took pictures of Sorrentine, Coppenrath, and Brennan. Unlike Seabiscuit, Coppenrath is one of the taller competitors in his sport, but his hometown nestled in the Northeast Kingdom is anything but big. On the other hand, he had gaudy game stats: 43 points (a career high and tournament record) on 14-for-19 from the floor, 14-for-15 from the foul line and 13 rebounds. Although Coppenrath played just one game, he won the Reggie Lewis Award as the tournament’s most outstanding player. Njila, who made all eight of his foul shot attempts and scored 13 points, joined Coppenrath on the All-Championship team with Sorrentine, who finished the title game with six points and five assists. As the praise kept coming, Taylor stood away from the mob and answered the media’s questions with honest, humble responses, as he usually does. In Coppenrath’s small Vermont village of West Barnet, residents borrow videos of UVM games from the general store, which anyone can check out on an honor system. Coppenrath displays his rural roots, saying he wants to be a math teacher when asked about the prospect of playing in the NBA. 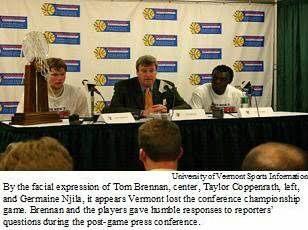 Coppenrath’s leadership and value system have rubbed off on the UVM team. Or maybe it’s the progress the team has made since its winless November to its undefeated January. The last time I was in Burlington, I looked in disbelief at the Burlington Free Press sports page lying on the kitchen counter at the Lands. The Cats had lost at Rhode Island by 38 points, on Dec. 30 to be exact. A few weeks later, in the showdown at Boston University, the players realized how fortunate they were to be able to have thousands of fans watch them play a kid’s game. 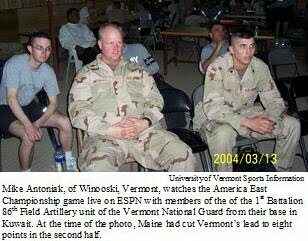 One of those fans was Winooski’s Mike Antoniak, who spent his final Saturday with his wife Candy watching UVM play BU before heading to Iraq. Antoniak, who watched the conference title game with his National Guard buddies, addressed the UVM team before they took the court against BU. He said he was taking a picture of his wife and daughters and his ticket stub from last year’s title game in Boston. After the tears, UVM won that game by two points. And they kept winning, especially when it counted most. Unfortunately, Hollywood could never do it justice.